Titanium Live, a three-day personal development seminar, will be held August 7-9 in Anaheim, California. Attendees will meet success-minded peers and find their personal blueprint for success in life and business. Total transformation of one’s life may seem like a slow, laborious process; however, it can in fact happen in merely three days. 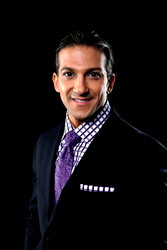 Titanium Live, a seminar led by Arman Sadeghi that offers attendees the strategies and techniques to alter their business and personal lives for the better, is proof. The event, which will take place from August 7th-9th at the Anaheim Convention Center, focuses on giving people the tools to live their happiest, most fulfilling lives possible. Live the life they’ve always dreamed of. Create a personal blueprint for success. Learn how to effectively manage their time. Achieve true happiness through balance. Create and enjoy more fulfilling relationships. Build a “Titanium” foundation for their business. Banish self-sabotage and live their true identity. Through Titanium Live, Sadeghi is able to help many individuals take their lives to the next level by empowering them to transform completely; another former attendee raves, "I have lost over 30 pounds in two months thanks to Arman's diet and workout methods. I look great, feel great, have more energy than ever and love my healthy lifestyle." Though some levels are sold out, tickets for Titanium Live are available for purchase .